Internet of Things (IoT) is the next big thing in technology for sure. As we witness a paradigm shift from IoT to IoE (Internet of Everything), IHS predicts that by 2020, we will have over 30 billion connected devices. People have started considering AI and IIoT (Industrial IoT) as the fourth industrial revolution as these technologies have started touching various industry sectors including healthcare, agriculture, retail, manufacturing, real estate, and the like. The good thing is the revolutionary IoT technology does not confine to industries only. Its coverage is very wide that includes our homes and city. Yes, smart homes and smart cities are two futuristic concepts based on IoT. The blog talks about how IoT adds comforts and convenience to our home. 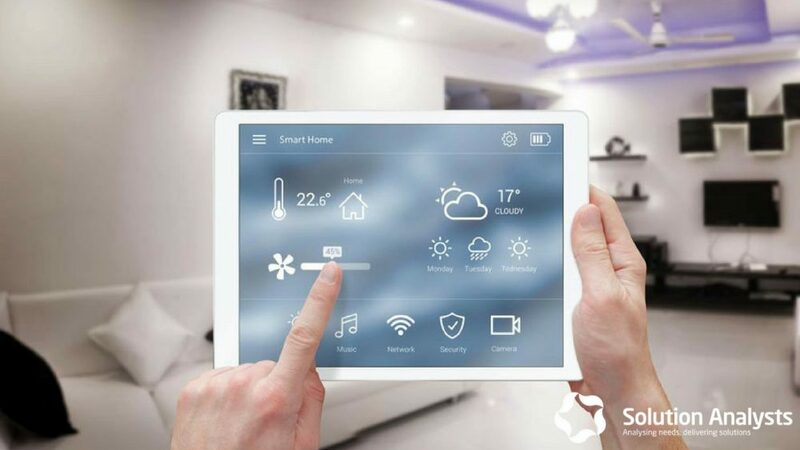 Home automation or smart home automation technology enables us to control a range of devices and appliances remotely by using a common network. In other words, all the devices and home appliances are connected to a common network and we can say it a “connected home”. You can control it from anywhere by using either a smartphone or a mobile device with a touchscreen. Home automation solutions offer a high-tech functionality and excellent comforts while making our life easier. By integrating IoT in the mobile app development process, we can get a smart and automated home where we can manage the temperature, monitor security cameras, and switch on the lights, and much more. Also, thanks to technological advancements, we can get customized home automation solutions without spending big bucks. It is interesting to see the difference between home automation and smart homes. Broadly, it is fair to mention that home automation is a process that integrates IoT technology to get an outcome in the form of smart homes. Homeowners can leverage many benefits of home automation solutions using IoT concept while enjoying control on basic home systems and appliances even from a remote point. These solutions enable users to manage various operations at home irrespective of time and place. Convenience- How about managing all the appliances from one place and through a single app? Home automation solutions offer enormous convenience. All you need to use a mobile app, and you can do many functions with different devices throughout your home from a remote place. When it comes to making a home management easier with excellent functionality, home automation is the best choice. More Flexibility- If you want to add new devices and appliances, then smart home solutions are flexible enough to enable you to do so. Technology advances at a rapid pace and even the state-of-the-art appliances of today will become obsolete tomorrow. But, with flexible home automation solutions, you can always add and integrate the new suite of devices in line with the latest lifestyle technology. Enhanced Security- When you leave your house, you can lock the entire house and turning off the lights with a single tap on your smartphone. You can also turn on the security camera and monitor your house. What’s more, even if you forget to turn off the appliances and turn on the camera, you can readily do it during driving or after reaching the office. You can also select to receive security alerts on various devices to remain vigilant. By providing real-time and live information, home automation solutions offer enhanced security. Complete Control- You can have a complete control of devices and appliances even from a distance. The thermostat control facilitates you to keep your house cooler before you come during the hot summer days. Your control of appliances enables you to turn off them after leaving the house. You can also check the lights on your way, and switch them off if you forget. In a way, home automation solutions offer you a complete control over various operations at home. Energy Efficiency- You can make your space more energy-efficient by using smart-home technology. Apart from precise control on HVAC (Heater, Ventilator, and Air Conditioning), you can program lights and motorized shades on an evening mode. It can turn on the lights as the sun sets and turn off the lights at the sunrise. Also, you can set lights in a way that they turn on automatically when you enter the house or room, and turn off as you leave. Improved Functionality- Smart homes have appliances with a better functionality as compared to other homes. It is because of the real-time operations or processes with the help of tailored home automation solutions. All your major appliances are connected with the automation technology, and this connectivity improves the effectiveness of appliances. All you get is more efficient and enjoyable lift at home! 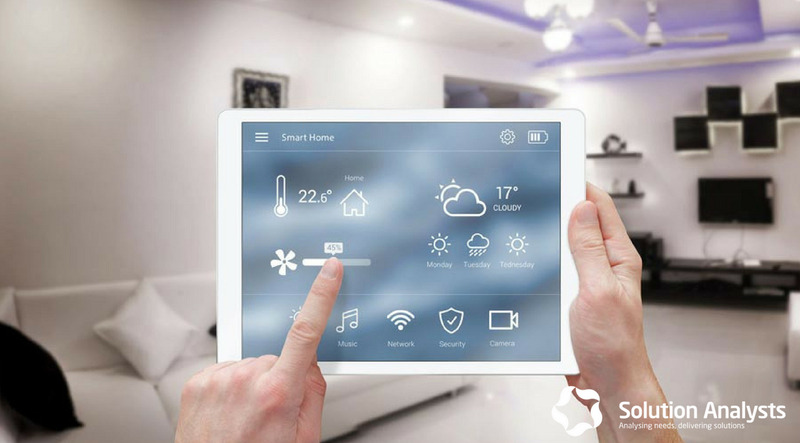 Better Home Management- Intelligently designed home automation solutions can enable you to tap into insights on home-based operations. You can easily get the data about your daily activities and manage your home in a better way. You can also analyze your daily habits and behavior to improve the lifestyle and increase the living standards. In a nutshell, you can manage your home in more secure and efficient way with the help of IoT-based home automation technology. Smart home technology thrives as many tech companies have jumped on the IoT bandwagon. We build innovative and intelligent IoT applications to meet the next-gen business and smart home requirements. Our home automation solutions are cost-effective and convenient for smart and luxurious living options. We provide a range of home automation services including IoT-enabled mobile app development for household appliances, iBeacon and wearable app development. If you want to know more about our customized home automation solutions, just send an email at sales@solutionanalysts.com, and our expert consultants will connect with you shortly. We are Developer, Innovators, & convergent thinker who endeavour to build the best exploit for the connected world.